This is the concluding volume of two symphonic cycles at once that have proved very rewarding. 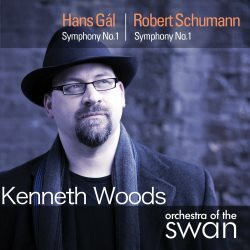 US-conductor Kenneth Woods and Stratford-upon-Avon-based Orchestra of the Swan's four-disc series has already delivered three pairings of Hans Gál's symphonies with those of Schumann, a composer Gál greatly admired. Volume one gave their Thirds (AV2230, review); volume two, Schumann's Second and Gál's Fourth (AV2231, review); volume three reversed these numbers for Schumann's Fourth and Gál's Second (AV2232, review). The Northern Sinfonia under Thomas Zehetmair have also recorded Gál's First and Second symphonies (AV2224, AV2225). Initially predating the Woods/Swans series slightly, these also came out on Avie, producing the curious state of affairs of a label 'competing' against itself. Zehetmair's cycle, if it was ever meant to be one, appears to have fizzled out, and Woods and the Swans thus have the honour of offering the first-ever recording of all four of Gál's memorable symphonies. The Swans could avail themselves of no better conductor for Gál than Woods. So tireless a campaigner is he for a composer who until recently went almost entirely ignored, that he has now been appointed Honorary Patron of the Hans Gál Society. Moreover, his expertise on Gál's music – as a cellist he has even recorded his String Trios with his Ensemble Epomeo colleagues, also on Avie (review) - is underscored by an appearance in May on BBC Radio 3's 'Composer of the Week', to discuss the composer with presenter Donald Macleod. Like most of Radio 3's programmes under controller Roger Wright, 'Composer of the Week' as a serious institution has been devalued in recent years by week-long features on the likes of Bill Evans, Michael Nyman, the 'Golden Age of Hollywood', Irving Berlin and more, but this recognition at last of Gál's genius gives some cause for optimism – particularly with the imminent change of management. Arguably, Woods and the Swans might have started their cycle most profitably with this final pairing of Firsts. Woods himself describes Gál's work in these listener-friendly terms: "the shortest of [his] four symphonies, the most extrovert in character and the most colourfully orchestrated." Like his later ones, Gál's First recalls at times Mahler and Strauss, although by this time (1927) Mahler was of course long dead and Strauss had all but given up writing orchestral music. In fact it is Franz Schmidt, arguably Austria's leading symphonist of the period, whose soundworld Gál most often approaches. Schmidt's best-known Fourth was just around the corner; Gál's First is not as long or sad, but it does share a good deal of its evocations of nostalgia and twilight, tinged with allusions to decadence, not to mention its compelling, kaleidoscopic lyricism. The delightful third-movement Elegy in particular, with its warming oboe solo, is utterly persuasive and winning. Almost a century earlier, Schumann wrote his 'Spring' Symphony, much loved by audiences, if not universally by critics. What the rather small-bodied Orchestra of the Swans loses in power – the famous opening here lacks the punch of a true f fanfare to ff tutti – it makes up for in textural clarity, with no end of detail made available to the listener. On the other hand, the more intimate orchestra size does reflect the realities of Schumann's resources, and in that sense this recording is more authentic than most. Woods was probably influenced by Thomas Dausgaard's interpretations of the symphonies with his similar-scaled Swedish Chamber Orchestra for BIS in 2008, as was, doubtless, Michael Schønwandt's very recent, and even better, cycle with the Netherlands Radio Chamber Philharmonic on Challenge Classics (CC72553). Neither Dausgaard's nor Schønwandt's Firsts differ much from Woods', the former-most's approach arguably most classical, but both the BIS and Challenge recordings have the undeniable benefit of 'SuperAudio' quality. Avie's sound is pretty good, it should be said, although it does suffer a little through direct comparison. Even so, in engineering terms the Avie cycle still tops many of the supposedly great Schumann recordings – their concentration in the hands of the big multinationals labels condemning them to their characteristically lossy sound. The Challenge double-disc offers all four canonic symphonies, plus the unfinished 'Zwickauer', for less than price of two Avie singles. That makes the Woods/Swans series more than twice as expensive per recorded minute, but this is easily offset by the immense value of the Gál cycle. Then again, although it would be going too far to suggest that this is an indispensable account of Schumann's 'Spring', it is unthinkable that Gál collectors will be disappointed by this sharp, ultimately refreshing account of one of his most cherished predecessors. The accompanying booklet and back inlay track-list both inexplicably give the final movement of the Schumann as 'Andante animato e grazioso' instead of 'Allegro animato e grazioso'. Apart from that, all is well with the documentation provided: Woods gives another well written, informative article on both composers and their symphonies in English, German and French.